Don't be schooled. 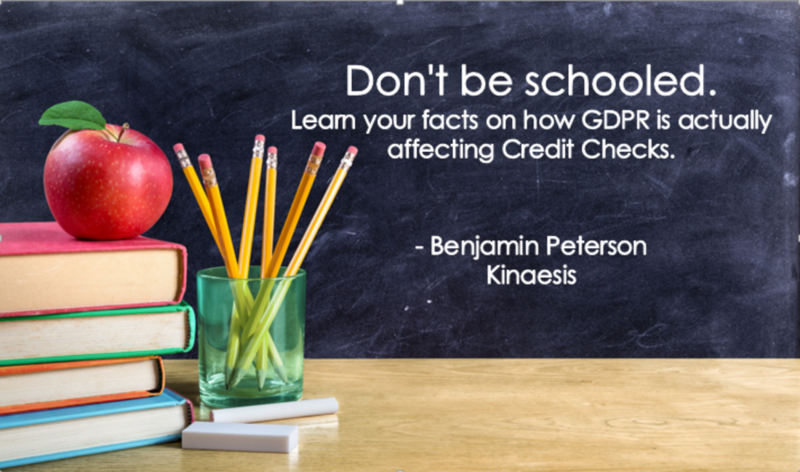 Learn your facts on how GDPR is actually affecting Credit Checks. GDPR will force changes onto pre loan credit check processes. Benjamin Peterson, our Head of Data Privacy, takes you through what to expect and how to solve the problems this will create. Some banking processes are more GDPR-sensitive than others. Pre-loan credit checks, that depend on modelling and analytics are very significant in GDPR terms. While consuming large amounts of personal data, they also involve profiling and automated decision making - two areas on which GDPR specifically focuses. Despite their importance, many have been assuming that these processes won’t be hugely impacted by GDPR. After all, credit checking is so fundamental to what a bank does - surely it’ll turn out that credit checks are a justified use of whatever personal data we happen to need? Recent guidance from the Article 29 Working Party – the committee that spends time clarifying GDPR, section by section – has demolished that hope, imposing more discipline than expected. October’s guidance on profiling and automated decision-making does three things: adjusts some definitions, clarifies some principles and discusses some key edge cases. It’s surprising how tweaking a few terms can make credit checking and modelling seem far more difficult, in privacy terms. - Credit checking is not deemed ‘necessary in order to enter a contract’. Lenders had hoped that credit checks might be considered as such and thus justified in GDPR terms. - Automated decision-making is prohibited by default. Lenders had hoped automated decision-making would not attract significant extra restrictions. - Credit refusal can be deemed ‘of similar significance’ to a ‘legal effect’. Lenders had hoped credit decisions would not be given the same status as legal effects – due to the restrictions and customer rights that accompany them. So, there are small tweaks that could prove hard work for data and risk owners. Banks will have to make sure that their credit checking and modelling processes stick to GDPR principles. Processes such as data minimisation and the various rights to challenge, correct and be informed will prove tricky to follow when other regulators need to audit historical models! But we can protect ourselves. One thing we can do is avoid full automation; fully automated decision-making has stringent constraints but adding a manual review sidesteps them. We also need to stick close to the general GDPR principles. For example, data minimisation - this can mean controlling data lifecycle and scope by utilising clever desensitisation and anonymisation to satisfy audit and model management requirements. This will keep you on the right side of GDPR. Additionally, the recent guidance contains a very interesting set of clarifications around processing justifications. The best kind is the subject’s consent. Establishing justification through necessity or unreasonable cost is complex and subjective; the subject’s consent is an unassailable justification. The recent guidance reinforces the power of the subject’s consent and tells banks how to make that consent more powerful still – by keeping subjects informed. The flip side is, of course, that the consent of an uninformed subject is not really consent at all and could lead to serious breaches. · The bank should find a 'simple way' to tell the subject about each process in which their personal data will be involved. · For each piece of personal information used, the subject should be told the characteristics, source and relevance of that information. Good metadata and lineage would make this task very easy. · The bank need not provide exhaustive technical detail – it’s about creating a realistic understanding of the subject, not about exposing every detail of the bank’s logic. · The guidance suggests using visualisations, standard icons and step by step views to create an easily understood summary of data usage and processes affecting the subject. So, if you want your banking business to experience minimum impact from GDPR, one message is clear – you need to provide transparency to your customers, as well as your internal officers and auditors. Just as you provide various perspectives on your data flows to your various stakeholders, you’ll benefit from providing a simplified perspective to your customers. The metadata, lineage and quality information you’ve accumulated now has an extra use case: keeping your customers informed, so you are able to keep running the modelling and checking processes that you depend on. Want more from our GDPR experts? Check out our GDPR solution packages here and see more of our regulatory compliance projects here. Or you can reach us on 020 7347 5666.